As one half of the celebrated MAW/Nuyorican Soul team, Louie Vega's legacy as a prolific remixer and producer has been etched into thousands of slabs of black vinyl. But when Vega first started out, he was driven by the pleasure of selecting and spinning music, and to this day the art of DJing - the communal, spiritual, above all, musical line of communication that runs between the spinner, the sound system and the dancing crowd - is what propels him forward. If Vega isn't DJing, he isn't happy. Vega started to spin at neighbourhood parties in the Bronx in the early 1980s and broke into Manhattan in 1985 when he was headhunted to spin at Heartthrob, which was situated on the site of the legendary Funhouse. The spinner subsequently played at the Underground Network and Dance Ritual, two of the longest-running nights in Manhattan. And since he first travelled to Japan in 1989, Vega has tirelessly spread the music - a music that often sounds like New York but is global in its Latin, African and European influences - to an international audience. For the best part of twenty years, Vega the DJ has been blessed with an unfair advantage - the ability to play acetates of his own remixes and productions before anyone else could lay their hands on them. Yet the mixmaster has also drawn in the crowds because of his uncanny ability to select and mix other people's records, and Vega's Choice compilation, which brings together some of his most heavily rotated vinyl in one sublime collection, encapsulates the breadth and depth of his "field of sound" (the aural equivalent of a "field of vision"). "There was a lot of musical variety back in the days of the Loft, the Gallery, the Garage and Zanzibar," says Vega. "Now everybody plays the four-on-the-floor house beat, but DJs used play four-on-the-floor with funk, jazz, Euro and syncopated rhythms. I mixed all of those things together on this record. I'm very proud of it." It's impossible to listen to Booker T. & the MGs, the Joubert Singers, Lamont Dozier, the Clash and the rest of the artists who make up this collection without remembering - or fantasising about - New York's downtown party network of the 1970s and 1980s. "Listening to these records was a powerful experience," says Vega, "and I've tried to capture some of that power here." This collection, however, is more than a make-believe trip down fading-memory-lane. "I still carry all of these records in my crates. I think it's important to educate people who might not have heard these jams before. All of these records have stood the test of time, which is amazing. 'Time Warp' still sounds like it could have been recorded yesterday." Two clubs - the Garage and Zanzibar - and two spinners - Larry Levan and Tony Humphries - had a particularly profound effect on Vega's musical philosophy. "I first went to the Garage in 1980 and I used to go to hear Larry at the Garage as soon as Heartthrob closed at five, five-thirty," says Vega. "I would head over there with twenty or thirty people and we would stay until it closed." Levan created an indelible impression. "Larry had no boundaries with his music and he knew how to put it all together. You knew how he was feeling when he played music - he had a way of making each record sound special. Plus he was very theatrical. Larry was a real inspiration." So, too, was Humphries. "Tony played everything, he told a story and he was a real mixer. He would create one song out of two records or have two records talk to each other, plus he rode these really long mixes. I went to Zanzibar almost as much as I went to the Garage. Tony had a lot to do with the way I DJ today." Even though he was playing to a young Latin crowd smitten with freestyle, Vega began to weave underground anthems into his Heartthrob evenings. "I was very much influenced by the Garage and Zanzibar, and I bought a lot of that music and played it to a younger crowd. I exposed them to that sound. I played freestyle, but I also mixed it up. It was all about variety." Kenny "Dope" Gonzalez, the "other half" of the MAW/Nuyorican Soul team, heard his future partner spin at Heartthrob and was impressed by the DJ's ability to expose these young Latin dancers to such a wide variety of music. "Chicago house was just coming into New York and there was also Latin freestyle and hip-hop. Louie played it all." Vega was introduced to Levan by Jellybean, ex-DJ from the Funhouse, in 1986. "I'd stand in the booth and watch Larry work the crowd," says Vega. "He probably saw me as a young kid out there playing." If he did, Levan had changed his mind by the summer of 1987. "Larry said, 'I'd love for you to do a guest spot.' He told me at the Garage. I couldn't believe it." Vega suddenly found himself on the verge of joining an exclusive coterie that included David DePino, François Kevorkian, Danny Krivit, Joey Llanos, David Morales, Larry Patterson, Victor Rosado and Tee Scott. "Louie was coming out of the freestyle era and he didn't get respect from the more underground DJs in New York," says Gonzalez. "They considered freestyle music to be too commercial and that made Louie a bubble gum DJ. Apart from Larry Levan, who showed him a lot of love, I don't think they understood where he was coming from or what he was capable of doing." By the end of the year the Vega was playing in the same booth as Levan- although not at the Garage, which closed in September 1987, and not at Heartthrob, which closed around the same time, but at Studio 54. "Heartthrob came to an end when an aggressive owner reopened Studio 54 for a younger clientele," says Vega, who was invited to play at the West Fifty-fourth Street venue. "My crowd from Heartthrob followed me there. I was playing freestyle, hip-hop, reggae, classics, and more and more house. Friday nights there would be twenty-five hundred and Saturday nights four thousand." Levan played on Thursdays. "Larry needed a new home. He was doing different spots here and there. His Studio night was packed. The Garage crowd came out to support him." In 1989 Vega mixed a number of Todd Terry releases (including "And The Beat Goes On" by DMS and "Just Make That Move" by Black Riot) and produced his first house track ("Take Me Away" by 2 In A Room), and the following year he teamed up with Gonzalez to form Masters at Work and remix "One Step Ahead" by Debbie Gibson, which included a special dub on the B-side that set underground dance floors alight. For a while Vega focused more on his studio work than his DJing, in part because he wanted to make a clean break from the world of freestyle, and the move paid off. By the end of 1991 MAW were recognised as the most exciting remixers on the New York scene and one of their fans, Don Welch, who was DJing at Savage on 23rd Street, invited Vega to guest at the Underground Network night he was running with his partner, Barbara Tucker. "Don had an R&B following and he wanted me to bring in an underground house crowd," says Vega. "Both sets of dancers blended perfectly, so we did it again." When Welch asked Vega if he would like to DJ every week he replied, "When we've got the right venue." That venue turned out to be the newly opened Sound Factory Bar, where Frankie Knuckles was spinning on Friday nights. "We went to check out Frankie's night and it was really happening," says Vega. "I loved the space." Hosted by Welch and Tucker, Wednesday night became Underground Network night, where a mix of industry insiders and funky dancers gathered to hear Vega work the wheels of steel (and make a decisive break with the freestyle scene). "The regular heads felt special because they were coming to an industry party and the industry people liked being with the dancers. Within a couple of months the night was flourishing." The Underground Network allowed Vega to put his DJing philosophy into practice. "I finally had a home where I could create a whole scene," says Vega. "It was the same vision that Larry had. The music didn't have a colour and if it was good I played it. The crowd became very multicultural, very open to different sounds. I'd play a Tribe Called Quest record, I'd play a Latin record, a rare classic, house, whatever." Club-kid-turned-producer/remixer Adam Goldstone remembers Vega's ability to meld distant continents and distinctive epochs. "One night he played the rootsy Santeria chants and percussion sounds of 'Yemaya Y Ochun' on the India album. From that he segued into the African outro of Lamont Dozier's disco classic 'Going Back To My Roots'. And then he moved into a dark tribal house track. That's five hundred years of Afro-Cuban musical history in three records, and, boy, did it sound sweet." Industry powerbrokers didn't just go to the Underground Network to meet each other. They also went to hear (and meet) Vega. "The most influential club for me was the Sound Factory bar," says Gladys Pizarro, A&R executive at the then hot new dance label Strictly Rhythm, who started to hand Vega her latest releases and commission some of the finest deep house productions and remixes of the 1990s. "Louie was my hero! I followed Louie throughout. He was like, 'Get away from me already!'" Seasoned spinners from the seventies and eighties - heads who had danced at the Loft, the Gallery, the Paradise Garage and Zanzibar - listened to Vega pump the sound system and joined in the rapturous applause. "A lot of the music Louie made in the early 1990s was timeless, so I really looked forward to hearing him play," says ex-Body & Soul resident Danny Krivit, who now spins at the hot and heady 718 Sessions at Deep. "I thought he was an extremely accomplished DJ. He had very good taste in music and he would regularly play some classic that I really didn't get to hear with other DJs. He would reach a little further and play it very well." Vega shared his newfound wealth with veterans and novices alike. When François Kevorkian mentioned that he wanted to start playing again, the Underground Network DJ offered him a residency in the downstairs Funk Hut, and when Joe Claussell struck up a friendship at Dance Tracks, Vega invited him into his booth. "Joe started coming to the club and he'd play on the crossover while I was spinning. He would always get to have a go at the end of the night." Vega also invited the likes of Tony Humphries, Frankie Knuckles and David Morales to take over the wheels of steel on special occasions, and when Lil' Louis agreed to make an appearance he insisted that the Chicago legend take over the main room. "I played downstairs in the Funk Hut that night," says Vega. "We always closed the Funk Hut at four so everyone would go upstairs for the last hour." Vega arrived to hear Lil' Louis put on "Thousand Finger Man". "The atmosphere was just amazing. It gave me another perspective." The Underground Network was living up to its name. "It was important for me to have great DJs come in and play, and it was great for these guys to play to one of the best dance crowds ever." Following in the slipstream of the Paradise Garage, the first underground club to regularly showcase both new and established talent, the Sound Factory put on shows featuring Barbara Tucker, India, Tito Puente, Michael Watford, Loni Clarke, Dajae, George Benson and many more. "Louie really thought that the Underground Network could mean something," says Ralph Muniz, a diehard fan of the DJ since the days of the Devil's Nest. "All of these huge names started performing their records there. People were hungry for the music and the underground sound really flourished." Puente's appearance, which coincided with a special birthday party for India, was particularly memorable. "The crowd went wild when Tito walked out," says Vega. "They played 'Love & Happiness' and then at the end of the song he kept playing like crazy. He was going mad and India started singing with him. After a while nobody could take it any more. The club just blew up." Benson, who performed "You Can Do It", turned in an equally compelling performance. "We had just released 'You Can Do It' and I wanted to him to see how the crowd was reacting to the song," adds Vega. "He couldn't believe their response and ended up jamming with us for a couple of hours. He sang 'Give Me The Night', 'Masquerade' - all of the classics. Everyone went mad." The Underground Network came to an end when the Sound Factory Bar closed in the autumn of 1996 and Welch and Tucker passed over an opportunity to move to Vinyl with Vega, who ended up playing Saturday nights at the downtown venue until Shelter returned two years later. By that time Claussell, Kevorkian and Krivit had started to stir up their Body & Soul storm on Sundays, and for a short while Claussell teamed up with Vega to play at a new monthly night, dubbed Dance Ritual by Claussell. "Roy Ayres and Jocelyn Brown played at the opening," says Vega. "It was an amazing night." The parties subsequently switched to Wednesdays when Vega decided he wanted to put on a weekly party. "The new night started slowly but as the nights grew they became even more multicultural than the Sound Factory Bar." Industry insiders were less drawn to the earthy environment of Vinyl and, according to some, the loss was a gain. "Louie developed more of a Shelter vibe at Dance Ritual," says Kevin Hedge, one half of the Blaze production team. "It was more about people coming in, dancing and getting into the music. In a way it made it a better party." Krivit agrees. "Dance Ritual was more focused on Louie, less on the industry, and it's stayed that way. It's just about Louie playing good music and people enjoying it." Six years on and counting, Dance Ritual hasn't simply survived Mayor Giuliani's sustained assault on New York's Nightworld - it is positively flourishing. "We moved from Shelter to Pinky to the new Shelter. Now we're at Cielo and Deep as well as Shelter," says Vega. "It's become very intimate, very family oriented. Everybody knows everybody in this core crowd of four hundred. And it's growing." Twenty years after his Manhattan DJing debut, Vega still spins vinyl with the same degree of kinetic enthusiasm as ever. Buzzing around his booth with a sparkling energy while he flips through his records and lines up mixes, Vega doesn't just play records - he feels them. Yet whether he's teasing the EQs or riding two records for an eternity, Vega has an almost supernatural capacity to execute flawless mixes. "I remember hearing Louie when he had just got back from one of his trips to Japan," says Mr V, a long-time Vega admirer and fellow DJ. "He was energized but tired, and at one point he seemed to fall asleep with the headphone pinched to his shoulder. I thought he was just pretending to be asleep because he was mixing these two records and his fingers were still manipulating the pitch slider, plus the mix was really tight. But then the record finished and he only woke up when he heard the pops and cracks at the end of the vinyl. He turned to me and said, 'Damn, I'm tired!'" Vega's ear is as musical as it is sharp. "Louie understands how records are constructed," says Hedge. "He will mix songs that are recorded in the same key or combine rhythms that blend together seamlessly." Vega is also inventive. "Not many DJs play with records like Louie," says Gonzalez. "He'll take two copies and work them like nobody else. He'll switch between the acappella, the vocal, the intro and the break, moving backwards and forwards. Nobody does that anymore, but Louie has always played with records like that and he still does it today. When you remix on the fly it drives crowds crazy and Louie is great at that." Following in the sonic path established by Bruce Forest at Better Days and Larry Levan at the Paradise Garage, Vega also brings musicians into his DJ booth in order to create jams over his selections, and for the last couple of years he has employed these instrumentalists to record custom-made overdubs for his Dance Ritual parties. Vega repeated the practice - really a gift - on this collection. "With 'Bra' I used Danny Krivit's edit, which he arranged perfectly. I told him that I wanted to do a special version with Selan Lerner, who plays keyboards for my EOL band, and Selan just tore it up. It just adds a little extra colour to the original." Ditto "Umi Says", where Vega asked Lerner to play a live synth solo in order to enhance the song's jazz moodiness. Ditto "Melting Pot", where Lerner grooves over an extended loop. And ditto "Spanish Joint", where Lerner plays a jazzy Rhodes solo. "'Spanish Joint' was a big record at Dance Ritual," says Vega. "I wanted to give everybody a taste of the things I do in the clubs when I bring in live musicians and jam with them." Vega's Choice amounts to a condensed expression of some of the finest, deepest, grooviest music to be played on New York's dance floors since 1970 - year zero, when David Mancuso started to hold parties at his home on 647 Broadway and Seymour and Shelley, carrying their gay bar crowd from the West Village to Hell's Kitchen, transformed the run-of-the-mill Sanctuary into the most exciting discotheque of the period. "These are records that I feel people should know about," says Vega. "The classics had a big impact on me and today I carry on that feeling." The fact that this collection includes recordings that are both old and new reflects the way in which Vega is able to play classics without cordoning off the past. "When I play classics I mix them up and I've tried to do this on this CD. When I was working out what I wanted to include I took at lot of songs that apparently had nothing to do with each other and somehow they gelled really nicely." This process of inspired juxtaposition - barely imaginable until it is put into practice, at which point it seems obvious -was perfectly realized on Vega and Gonzalez's seminal Nuyorican Soul album, where established names recorded fresh songs and newer faces explored the archives, and this act of temporal and generic blending found its ultimate expression in a live performance for crowd of ten thousand music lovers in Central Park, New York. Opening the show with a DJ set, Vega unerringly captured the mood of the crowd when he played a Tito Puente instrumental and dropped Martin Luther King's "I have a dream" speech over the top. The Nuyorican Soul band subsequently took to the stage and played classics such as "City, Country, City" and "Melting Pot" to the accompaniment of a forty-strong dance troupe. And the show climaxed with live performances from Roy Ayres, Jocelyn Brown, Jazzy Jeff and Jody Watley. "It was the perfect way of giving back to the community and the dancers who have been supporting me for so many years," says Vega. "There were a lot of children in the park that afternoon. It was one of the most beautiful days of my musical career." Vega's new EOL Band album is the next step. The project was born when Vega invited Kevin Hedge and Josh Milan, a.k.a. Blaze, to visit him in the studio and write a song over some Latin rhythms and a bass line that he had just laid down. "We gave him 'Elements of Life', which we had written eight years earlier," says Hedge. "It was the most Latin song we had written and it seemed to be perfect for where he wanted to go spiritually." The result was a sublime combination of syncopated rhythms and positive vocals. "I like to think of Louie as the Quincy Jones of house music. The production on 'Elements of Life' was breathtaking. He took a good song and turned it into a great record." Vega subsequently formed Elements of Life, a nine-piece outfit that heavily features Nuyorican Soul musicians, and the group's debut LP will be released in the spring. "We presented the album in Miami and also did sixteen shows in Japan last summer," says Vega. "We had a great time. I loved recording the album and then giving it a live interpretation with the band." The connection with the dance floor remains, and not just because tracks such as "Brand New Day" (also penned by Blaze) have been driving DJs and dancers wild. Orchestrating the mood on New York's dance floors and conducting a hot band, it turns out, are part of the same continuum. "Elements of Life is Louie's interpretation of his musical history," explains Muniz, Vega's right-hand man. "This is what he's experienced, it's what he's danced to. Elements of Life isn't just about Louie going into a studio and producing great records. These records have meaning." 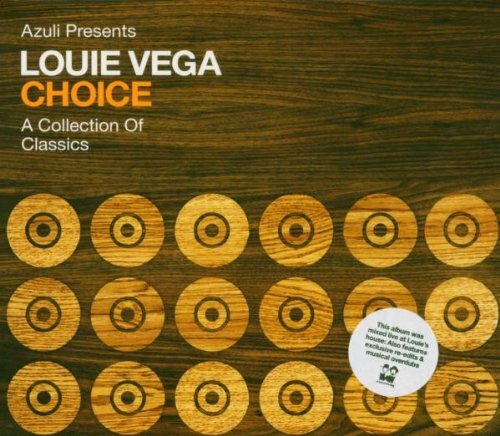 Now you can hear that history, feel that history and understand that history on one compilation - Louie Vega's Choice. Tim Lawrence is the author of Love Saves the Day: A History of American Dance Music Culture, 1970-79, published by Duke University Press. Available from amazon and good bookstores. "Little" Louie Vega is an icon of the New York house music community and the sounds he and partner Kenny "Dope" Gonzalez have produced over the years have changed the way house music is made, produced, promoted and sold. With a solid army of believers running their Masters At Work label among other entrepreneurial endeavors, Vega and Gonzalez continue on their mission to explore music on their own terms. Louie's choice track [to remix], however, was 'Salsa House', a Nu Groove release that combined a sample from Celia Cruz's 'Kimbarra' with a fragment from 'I Need You' by Sylvester. "It had this nice Latin house groove," says Vega, "and all of a sudden it went into these great R&B disco changes. I really liked the song, but I also wanted this one part to run longer." The prospect of doing a remix became a real possibility thanks to Terry. "I told Todd that I liked the track and he said, 'Hey, I know the guy who made it [Kenny Gonzalez. I'll introduce you to him.'" At the same time the sound of the emerging New York underground was always within earshot thanks to two of Vega's older sisters, Myrna and Edna, who were regulars at David Mancuso's influential Loft parties, as well as derivatives such as the Gallery and the Paradise Garage. "They were heavy party girls," says Vega. "They loved the scene and they taught me about club music." Illicit recordings came to play an important role. "They'd come back with tapes. I started listening to all of these records and I was like, 'Wow, this music is great.'" Louie seemed destined for a career in music from birth as he comes from a family deep in musical tradition. His father, Louie Vega, Sr., is an accomplished Jazz and Latin sax player, and his uncle, Hector La Voe, was a famed Salsa singer. While still in his teens, Louie started spinning at the Devils Nest, Heartthrob and Studio 54. By the time he stated doing production work, he had worked in nearly every club in New York City and had reached near legendary status as a DJ in the dance music community. [Arthur Russell] Fond memories of my friends and I partying at The Garage, Loft and Funhouse. This is a record I can always play at any club and people still ask what it is. Big up to François for a classic mix. Another record with unforgettable times at The Garage with Larry Levan jammin’ away. Timmy Regisford's parties at Studio 54 in the mid 80's, and Zanzibar with Tony Humphries, were my memories of this song. This record is still in my crates. I remember my sister playing this at home in the early 70's. One of my all time favourites. This record is perfection to me. My older sisters were a big influence for me as a DJ. These records were always on my mind at 6 or 7 years old. My sisters would come home with tapes and I would hear this great music pumping from their bedrooms. "Woman" is one of my favourite songs. It's the right song to dedicate to your woman. I did. GERALDINE HUNT "CAN'T FAKE THE FEELING"
This is a pure R& B Dance. I used to roller skate from 1979-82, heavily. This was a record that made me rock the floor at Laces, Long Island, with DJ Danny Krivit, DJ Big Bob at the Roxy and DJ Mad Wayne at Skate Key. I love her voice, it's one of a kind.